In this article I will explain three tier architecture in asp.net. We are using three tier architecture to maintain code separation & reduce coupling in code. 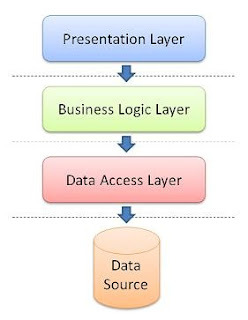 It consist of three layers Data Layer, Business Layer & Presentation Layer. 1-Data Layer :Data Layer directly communicates with the database. All database operations like select, insert, update & delete are performed on the data layer.In ASP.NET project data layer is class library. 2-Business Layer :Business Layer directly communicates with the data layer.It contains business logic, validations or calculations related to the data. In ASP.NET project business layer is class library. 3-Presentation Layer :Presentation layer concerns with view part only.It contains pages like .aspx or Windows Forms forms where data is presented to the user or input is taken from the user. The ASP.NET web site or Windows Forms application (the UI for the project) is called the Presentation Layer. Note: Presentation layer should not contains reference of Data layer in project. Here I am giving example of Three Tier architecture. Here is the reference of videos. 1- How to create Three Tier architecture using dbml or Linq to sql classes.